Mark Zuckerberg celebrates his 32nd birthday at Facebook HQ with Daughter... Max! 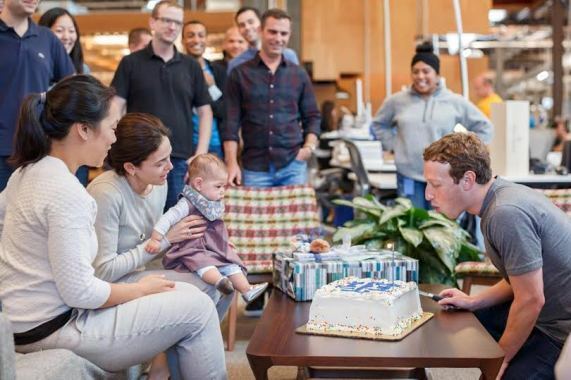 Mark Zuckerberg had a special guest at the company's headquarters to ring in his birthday- his adorable daughter Max. The Facebook CEO and founder took to his page to announce the news about his special visitor. The post was accompanied with a cute photo of his daughter looking at him blow out a candle on the birthday cake. Also pictured is his wife, Priscilla Chan and others. "Max stopped by Facebook HQ to help celebrate my birthday. Thanks to everyone for so many nice messages. Here's to another year of connecting the world"
BongoToday.com - Entertainment and Lifestyle : Mark Zuckerberg celebrates his 32nd birthday at Facebook HQ with Daughter... Max!